Yesterday four of us met to fight our first Warhammer Fantasy battle for a very long time. 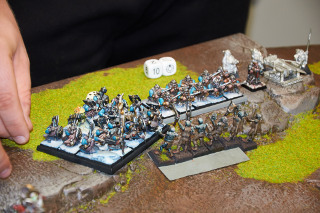 It was fun, exciting and there were some real epic moments :) Also it was a great opportunity to lead the dwarfs Androsch painted into their first battle ever. So please welcome the opponents! On the right side of the ring....Darkezekiel and his Tomb Kings! Together with CollectusMaximus and his new and hungry Dwarfs! On the other side equally eager to start fighting....Androsch and his Vampire Counts! Accompanied by Morgaine and her usually distracted Orcs & Goblins! Before the first round starts, let me introduce the armies a bit further. We played 500 points each, so 1000 points faced 1000 points. Darkezekiel relied on a Liche Priest, 10 Skeleton Archers, 3 Skeleton Chariots and 3 Necropolis Knights. At his side CollectusMaximus fields a Master Engineer, 20 Dwarf Warriors, 10 Thunderers and a Grudge Thrower. Androsch chose a Vampire, 14 Skeleton Warriors, 10 Crypt Ghouls and 5 Black Knights. And last but not least I picked a Night Goblin Shaman, a Night Goblin Mob with 30 Night Goblins, an Ork Boyz Mob with 20 Orc Boyz and 14 Black Orcs. Aaaaand there we go! Let's get ready to rumble!!! 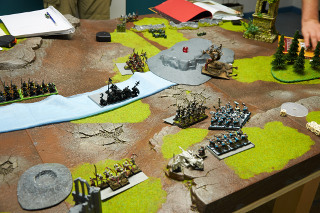 The Vampire Counts and the Orcs&Goblins get the first move and try to move as far as they can. It is clear that they are the one who have to initiate the close combats since they have no artillery and no long distance weapons with really long shooting ranges. On the other side, the Tomb Kings and the Dwarfs decide to stay and wait. 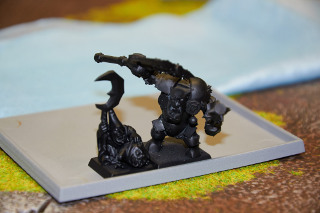 The Dwarfs load their Grudge Thrower and aim at the approaching Black Orcs. They shoot and 6 Black Orcs go down...what an amazing shot! Vampires and Orcs advance undaunted, eager to land their first strike against their enemies. As the Skeleton Warriors reach the river in the middle of the battlefield they discover that it is a rapid and refreshing river. Bad luck for them! Now they have to deal with the river first. The Vampire tries to cast a spell and conjure 10 Ghouls in front of the Dwarfs on the hill. That will keep them busy for a while. Too bad the spell was casted with total energy! Immediately the Dwarfs try to strike back and aim the Grudge Thrower once again at the Black Orcs. But bad luck stays with them as the Grudge Thrower breaks down and takes a crew member with is. In the third round the river stays the main problem of the Orcs & Goblins and the Vampires. But they have no choice! Fortunately the river is merciful and only takes a few sacrifices. The Vampire tries to cast the spell again. This time the Ghouls appear a few inches away from the Dwarfs. 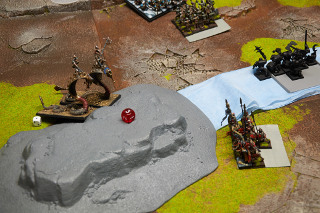 Still the Orcs and Vampires cannot reach their opponents. 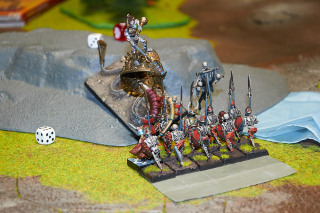 Now the Tomb Kings strike back and send the Skeleton Chariots wipe out the Black Knights. Unfortunately they can't reach them. Instead the Necropolis Knights close in on the Skeleton Warriois with the Vampire. They roll a dice and it is a 6! They hit a deathblow! Now everything depends on the deflecting roll of the Vampire. Aaaaaaaand....it's also a 6! Unbelievable! He did it! With that amazing save the Orcs and Vampires come in with full force! 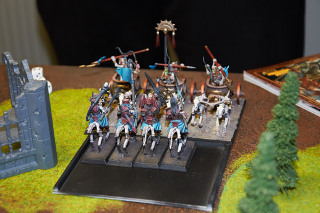 The Black Knights rush into a close combat with the Skeleton Chariots. It is a fatal hit and the Chariots will not recover from it. In the second close combat the Skeleton Warriors wipe out the Necropolis Knights while the Vampire fails to cast a spell. 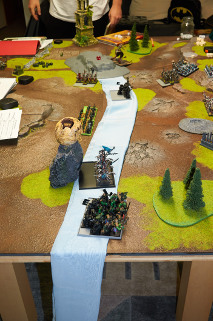 The Black Orks finally manage to cross the river,but they are down to the Boss and the Night Goblin Shaman. The Boss draws himself up to his full hight and clenches his weapon whereas the Shaman hides behind him. The Dwarfs don't hesitate for a second and with an angry roar the Black Orc Boss goes down, followed by the Shaman. What a brave couple of warriors but in the end they had no chance. The Skeleton Warriors aim once again at the Night Goblin Mob and this time it is too much. Squeaking and shouting the rest of them turns around and runs. Since all the battles have been fought and no aim for anybody in reach, the Vampire and the Liche Priest cast their last spells but with no result. So after 5 rounds of heavy battlefield action the points are counted.....and the winner is.....nobody! It's a standoff! This is the end of our first Warhammer Fantasy Battle. Congratulation to the Dwarf for their glourious first battle and also to the other brave warriors! I'm pretty sure this wasn't their last conftontation. See you soon at the battlefield!